1 of 4 Heat oven to 400 degrees F. Bring a large pot of salted water to a boil. 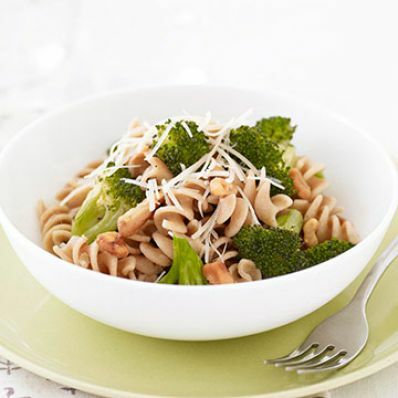 2 of 4 Combine broccoli, garlic, walnuts, salt and pepper in a medium-size bowl. Drizzle with olive oil and stir until coated. Place broccoli mixture on a large rimmed baking sheet and roast at 400 degrees F for 13 minutes, stirring twice. 3 of 4 Cook pasta following package directions, about 10 minutes. Drain and return to pot. 4 of 4 Add broccoli mixture to pasta pot and stir in broth, butter and Parmesan cheese. Serve immediately.